Disney Cruise Line and Star Wars are teaming up to bring the iconic characters to a the Disney Fantasy beginning in January 2016. 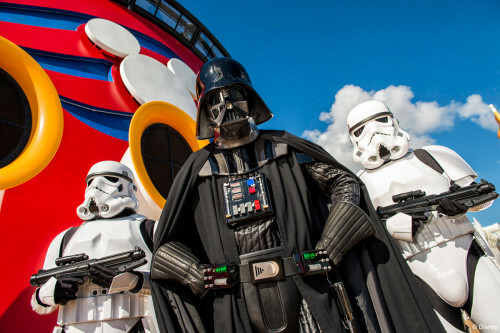 Each of the eight, 7-night sailings will feature a Star Wars Day at Sea. This new onboard experience will be the first official appearance of Star Wars aboard a Disney Cruise ship. I guess I will take credit for this considering I suggested this on the day Disney made the big purchase from Lucas. 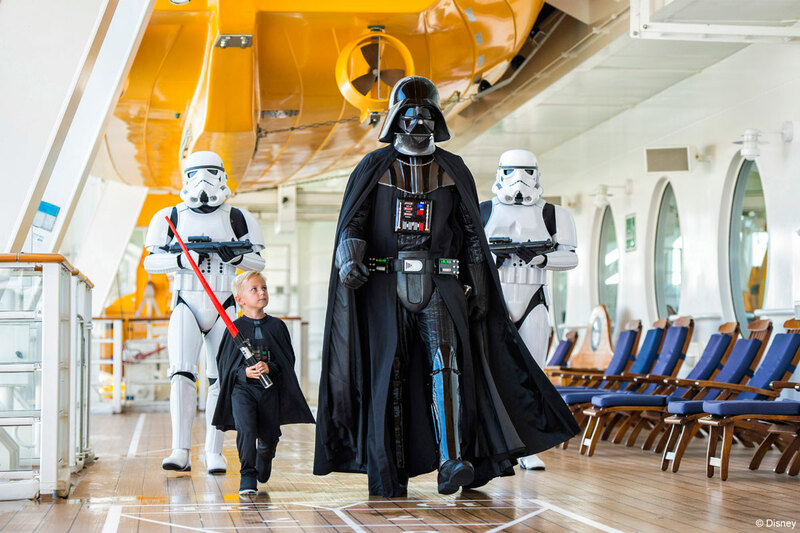 Star Wars Day at Sea will be featured on 7-Night Western Caribbean Cruise on Disney Fantasy Featuring Star Wars Day at Sea sailings on January 9, 23; February 6, 20; March 5, 19; April 2 and 16, 2016. Star Wars Day at Sea will transport passengers to a galaxy far, far away — in the Western Caribbean. The event features a full day of Star Wars celebrations, including a deck party, meet-and-greets with favorite characters, Star Wars-themed youth activities, unique food and beverage offerings, and special merchandise. Additionally, the Star Wars films along with Disney XD animated series, Star Wars Rebels will screen. Meet and greets will feature fan favorites such as Darth Vader, Chewbacca, Boba Fett, Stormtroopers and other characters from across the Star Wars galaxy. A version of Jedi Training Academy specifically designed for the ship will be available for young Padawans which will teach Jedi hopefuls some proper lightsaber moves which will culminate with a face off in a final test against the evil Darth Vader. 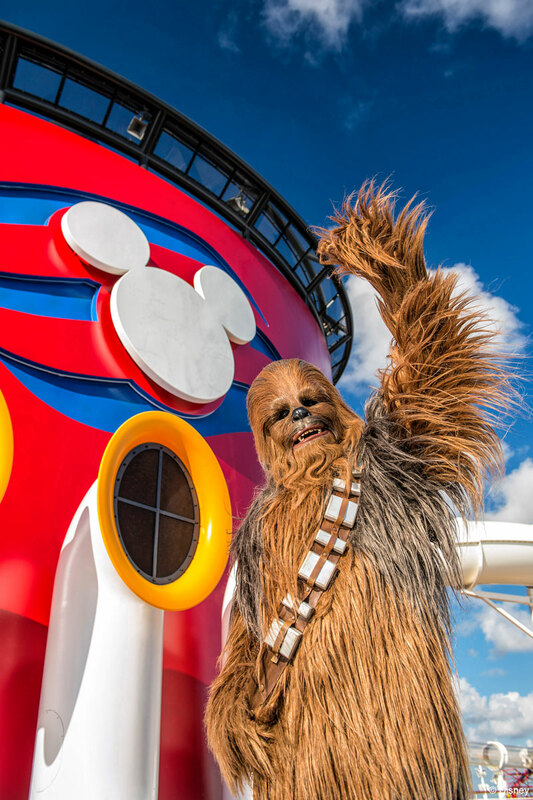 During each of the special sailings, celebrities and insiders from the Star Wars galaxy will share their experiences, meet fans and sign autographs. To cap of the activities there will be a Star Wars Deck Party complete with fireworks. The Star Wars deck party blasts off to an exciting evening filled with music, dancing and games. Star Wars characters will converge on the deck stage for a celebration of the Star Wars saga in a show featuring special effects and guest participation. The deck party culminates in a spectacular display of themed pyrotechnics, lighting, sound effects, lasers and Star Wars. This is not the first big announcement from DCL. Recently, it was announced that there will be special Frozen inspired experiences coming to the ships this summer. Disney Cruise Line be confirmed that this is not replacing Pirate Night on these sailing. Guest will have the opportunity to enjoy both themed experiences. However, fireworks will only take place once during each cruise as part of the Star Wars event. Will you be booking one of these sailings? This entry was posted in Itineraries, News and tagged Disney Fantasy, Star Wars, Star Wars Day At Sea by Scott Sanders. Bookmark the permalink. This is sooo coool! And the best thing is I am already booked for the April 2 2016 sailing! This is now an added bonus. So excited and my son will be too! Will the fireworks/deck party replace the Pirates in the Carribean festivities on theses sailings? If it helps, I was told by Guest Services will not replace the Pirate Night, but be in addition to it. The confirmations are coming through Star Wars Day noted as an itinerary instead of a port of call. It should also not replace the Formal or Semi Formal nights. I got an email from DCL with their letter stating about the Star Wars cruise. It now kind of makes sense, I noticed that the Western itinerary cruises for early 2016 dropped a port, only two ports of call versus three. I wonder if these Star Wars cruises were the reason for dropping Jamaica as a third port? Arghhhh. NONE of the dates line up with our school calendar! Disney can make up for it if they come back to New York that summer. Please? Does this mean the new Star Wars movie will not debut on December 18 (the movie premiere date) on the Disney ships – will they only show during the Star Wars cruises? Star Wars should still PremEAR on 12/18/15. Just booked for the April 2nd cruise! Wondering if they’re going to show the new Star Wars movie? The article only stated “6” Star Wars movies to be shown on the ship. I saw this as well, but figured the 7th was a given. @Gina Davis, per DCL website they will show the VII movie. The only at-sea screenings of Episode VII, at this event will thrill Padawans (Jedi in training) and Jedi Masters in every family. It is … your destiny. So awesome! I just got my tickets for this a few days ago. Super excited!